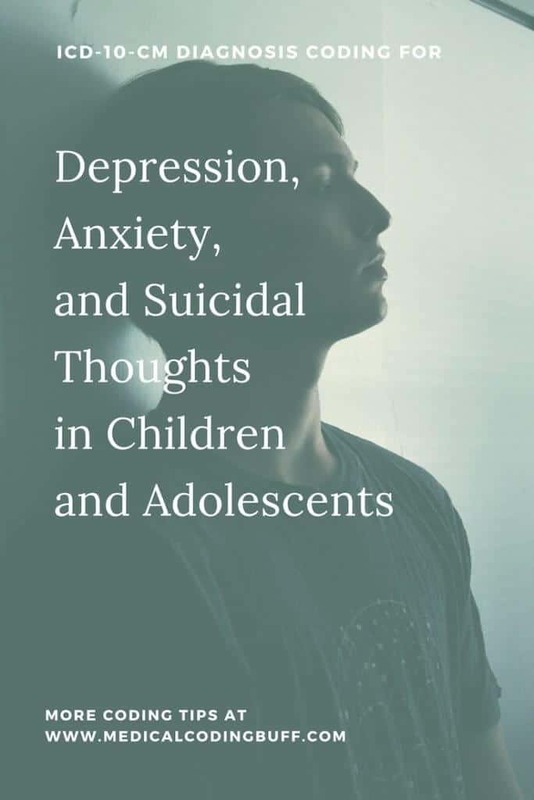 Depression can be a big problem in not only adults but in children and adolescents as well. This coding scenario involves assigning the appropriate codes for depression with anxiety and thoughts of suicide in ICD-10. Question: A 16-year-old male who has been seeing his physician for anxiety and depression for a few years has become highly depressed and is refusing to get out of bed when he is not in school. His symptoms include crying, insomnia, decreased appetite and weight loss, decreased concentration, and suicidal thoughts with a plan. The patient has been hearing voices talking to him and states it is his mom’s voice, but she is not home when this occurs. Patient is taking Zoloft and uses an inhaler. He made several trips to the emergency room recently for panic and anxiety attacks and was treated for his symptoms. Assign the appropriate ICD-10-CM codes. According to the ICD-10-CM Coding Guidelines, depressive disorders are broken down by the type of depression (major, organic, etc. ), temporal factors (single or recurrent), severity (mild, moderate, or severe), and any psychotic symptoms. The documentation states the patient is “highly depressed,” has “suicidal thoughts with a plan,” and “panic and anxiety attacks. The episodes are recurrent rather than a single episode, and he is “hearing voices,” which is a psychotic feature. Looking in the ICD-10-CM coding manual Index, see Disorder, depressive, recurrent, with psychotic symptoms F33.3. Verified in the Tabular, F33.3 refers to Major depressive disorder, recurrent, severe with psychotic symptoms. The patient has suicidal thoughts, or ideations. Looking in the Index, see Ideation, suicidal R45.851. In the Tabular, R45.851 refers to suicidal ideations. See the note at R45.851 that states, “Excludes1: suicide attempt (T14.91).” Attempted suicide does not apply here, so we can ignore this note. There is also a note that states, “Excludes2: symptoms and signs constituting part of a pattern of mental disorder (F01-F99).” This means if both conditions exist, both conditions should be reported. The patient also has anxiety and panic attacks. Looking in the Index, see Attack, attacks, panic F41.0. This code can also be found by looking up Anxiety, panic type F41.0. Verified in the Tabular, F41.0 refers to Panic disorder [episodic paroxysmal anxiety]. Again, be sure to read all Includes and Excludes notes. They all mean something. Note: It is not uncommon to see more than one psychiatric condition exist for the same patient. Be sure to code for all comorbid conditions. The above coding exercise is an excerpt from my article that appears at JustCoding.com under the title, “ICD-10-CM Coding For Anxiety and Depression in Children and Adolescents.” Be sure to check it out if you have a subscription.